February 27, 2018 By Elizabeth Lindemann 2 Comments / This post may contain affiliate links. 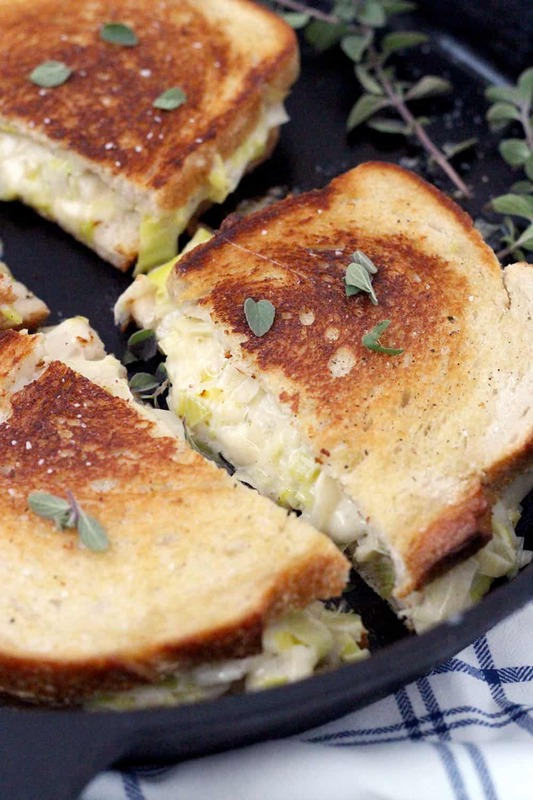 This Leek and Gruyere Grilled Cheese recipe will knock your socks off. It’s rich, buttery, melty, and every bite is infused with the delicate, mellow onion flavor leeks are known for. It only takes 20 minutes to make four of these scrumptious sandwiches, and they’re the perfect lunch or dinner paired with a green salad or light soup. If you’re looking for a low-fat meal, this is decidedly not it. This is decadence in sandwich form. Butter, butter everywhere… (and cheese, AND mayo… but I’ll get to that in a sec). I have to take a second to give the Queer Eye revamp on Netflix a shout-out. 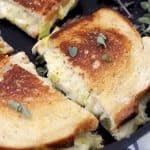 Not only did Episode 2 (Saving Sasquatch) give me the inspiration for this genius leek and gruyere grilled cheese recipe, but it’s one of the most heart-warming shows I’ve seen in a long time. I definitely recommend it. Gruyere is one of my favorite cheeses- it’s a bit pungent to smell, especially as it cooks, but the flavor is so good with the leeks and the texture melts to perfection. The first, and perhaps most important, step to this is washing the leeks. Leeks are delicious and delicate and, when sautéd, they soften to a buttery, melty texture. But they are also notoriously sandy and dirty. First, cut off the roots and the dark green parts. You won’t use these. Then, slice lengthwise in half, and cut each half into thin slices. Add the cut leeks to a bowl of water, stir around a bit to separate the layers, and allow to sit for a little while. The dirt will sink to the bottom of the bowl and the leeks will float to the top. Remove the leeks with a slotted spoon and place in a colander. Don’t just dump all the leeks with the water from the bowl into the colander, as this will just redistribute the dirt right on top of them again. Then, give them a final rinse under cold water in the colander. It’s not hard to clean leeks using this method, but it’s essential in making sure you don’t get a sandy mouthful in this gorgeous sandwich! After washing the leeks, sauté them in butter and salt until they soften a bit. Then, add a bit of water to the skillet and continue sautéing, stirring occasionally and adding more water if necessary, until they soften completely and the water has evaporated. You don’t want the leeks to brown or be crispy- you just want them to sweat until they reach that gorgeous, melty texture they are known for. The filling is a mixture of grated gruyere cheese, the sautéd leeks, and (don’t hate me) mayonnaise. Are you drooling yet? Told you this was decadent. The mayo helps bind the cheese and leeks together, making it easy to spread on the bread, and enhances the creamy texture. 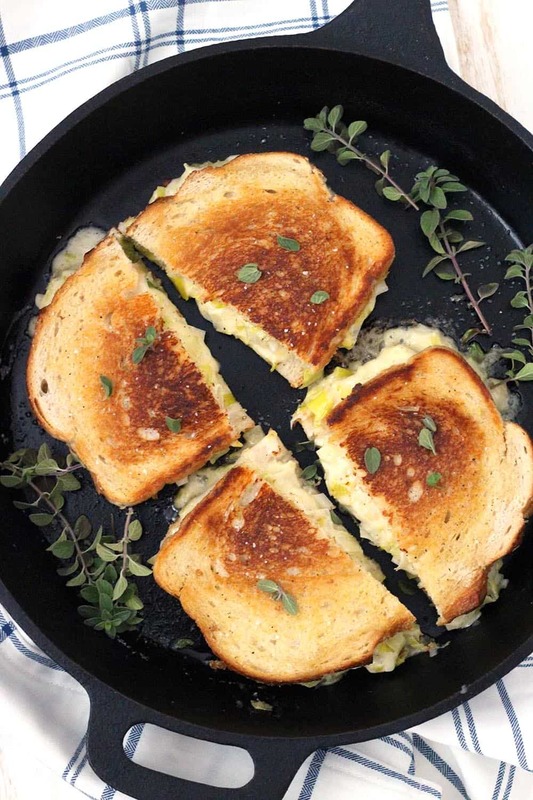 I like cooking grilled cheese in a cast iron skillet, but you can use another kind of skillet, grill pan, or panini press if you want. Cook on low to medium heat. At too high of a temperature, the bread will burn and the cheese won’t melt properly. Cover the skillet when you are cooking the first side of the sandwich. This will trap the heat and cause the cheese to melt faster, which will glue the pieces of bread together and make flipping MUCH easier. 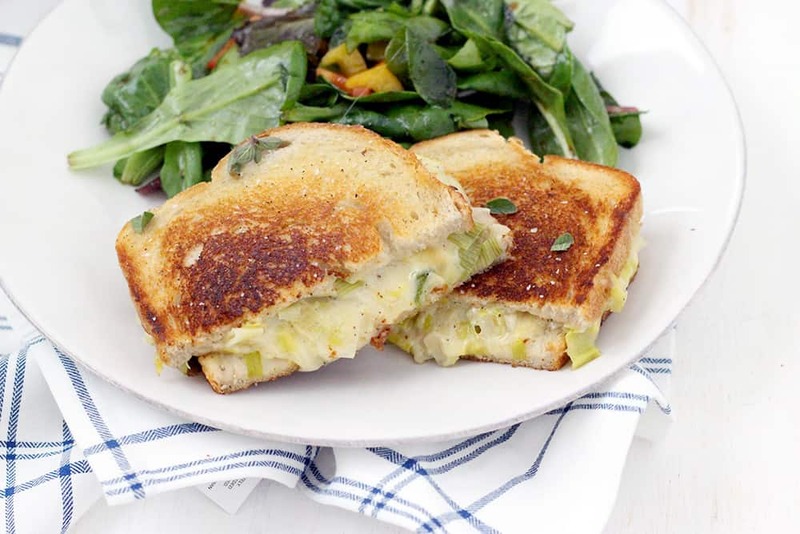 Here’s the recipe for Leek and Gruyere Grilled Cheese! 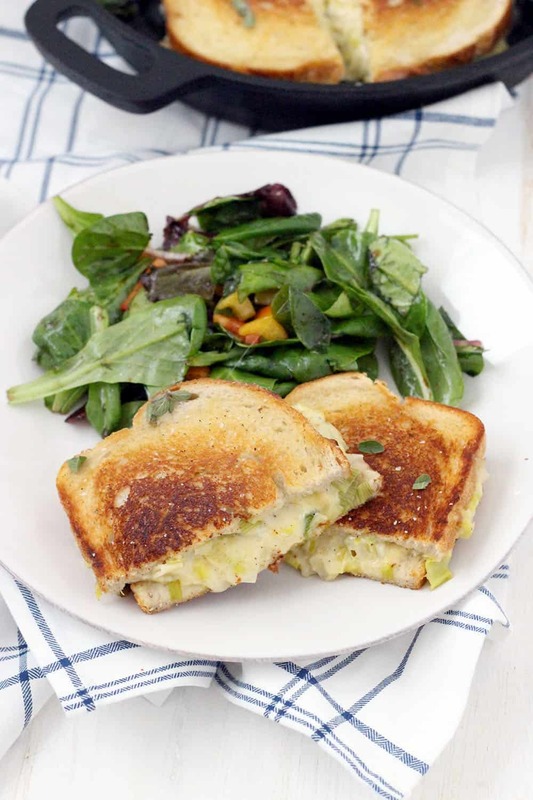 This Leek and Gruyere Grilled Cheese recipe is rich and buttery. Every bite is infused with perfectly melted cheese and that subtle, savory, onion flavor leeks are known for. The perfect easy weeknight dinner with a simple salad or light soup! Melt 1 tablespoon butter in a cast iron (or other heavy) skillet over medium heat. Sauté the leeks in the butter with a pinch of salt for about 1 minute, until starting to soften. Add 1/4 cup of water, stir, and allow to continue to cook for about 5 minutes, or until leeks are very soft and water has evaporated, with almost a melted texture, adding more water if necessary and stirring occasionally as they cook. Meanwhile, use the remaining butter to spread on one side of each piece of bread. Place four of the slices butter-side-down on a cutting board or plate. In a small bowl, mix together the mayonnaise and the gruyere cheese, along with the cooked leeks. Season to taste with salt and pepper. Divide the leek and cheese mixture evenly on top of the butter-side-down pieces of bread. Place remaining pieces of bread butter-side-up on top of each sandwich. In the same skillet (you can use a grill pan or panini press if you prefer), grill the sandwiches on medium heat for about 3 minutes on each side in two batches. If sandwiches are cooking too quickly, turn heat down. I recommend covering the skillet while you cook the first side so the cheese melts more rapidly- this will make flipping the sandwiches easier since the sandwich will be "glued" together by the cheese. Cut in half and serve immediately while hot and melty! Leeks are notoriously dirty, so it's important to clean them thoroughly. After trimming off and discarding the root and dark green parts, slice lengthwise and then into slices about 1/4" thick. Place in a bowl of water, stir around to separate the layers, and allow to sit for 30 seconds or so. The dirt will sink, the leeks will float. Use a slotted spoon to remove the leeks and place in a colander. Give them one final rinse in the colander. Don't dump the water from the bowl on top with the leeks into the colander, as this will just add the dirt back on top of them. Aw thanks so much for including me! Can’t wait to see it!